Tonight is an exciting night. Miss America returns to Atlantic City. There is a huge parade scheduled to celebrate the return to the boardwalk. This is huge because the last time Miss America was in Atlantic City was in 2004. It moved to Las Vegas but somehow it just wasn't the same. But now it's back and the only thing that could be better is if I was there with my mom, aunty and cousin tonight to watch the actual event. 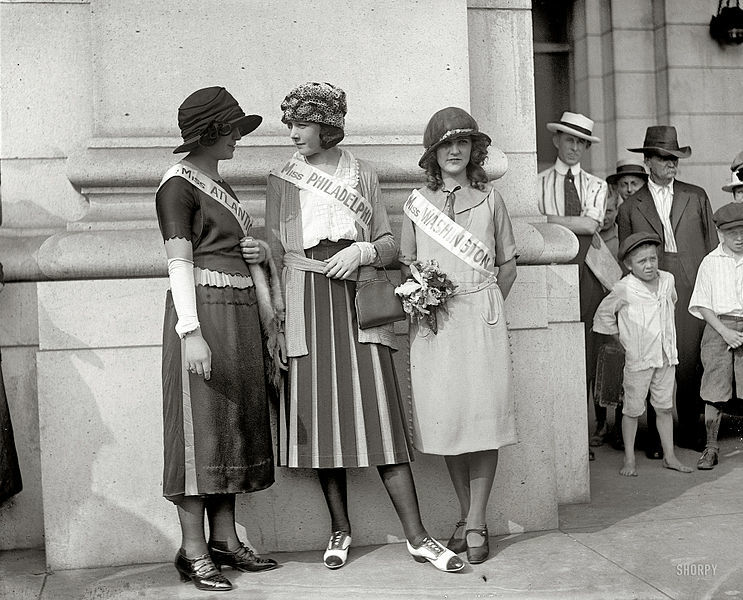 This photo is a picture of Ethel Charles (hostess, Miss Atlantic City), Nellie Orr (Miss Philadelphia) and Margaret Gorman (Miss Washington, D.C.) at Union Station in Washington, D.C.
Gorman would be crowned winner at the very first Miss America pageant. The Miss America Pageant was first televised in 1954 and in 1955 Bert Parks took on the role of the host of this annual scholarship pageant. I started watching Miss America in 1963. Bert Parks and the traditional song "There She Is" had a huge impact on my early childhood development. Did I think I would grow up to be Miss America? No - but I knew from watching that show that every woman had greatness within her and whether we wore the crown or not we could all be Miss America. I haven't been able to find a video of Bert singing this in the 60's or 70's but this clip is from a special reunion celebration in 1990 with past Miss Americas lining the runway. Even watching this clip brings tears to my eyes. I have such fond memories of those special evenings once a year when we would gather around the TV and vote for a favorite contestant during the parade of states. It seemed like Miss Texas was always in the top 10 and Miss Washington rarely was. Actually, Miss Washington has never taken the crown. Finally, in 2002 Miss Oregon, Katie Harman won the first time for anyone from the Pacific Northwest. Since then my mom has become friends with Miss America 2002 as Katie routinely performs at a regional theater where my mom is on the fundraising committee. Even 10+ years later, Katie Harman continues to Miss America - she is gracious and lovely and gives back to her community. Katie was crowned on the first pageant after the events of 9/11 and it was a very moving year. She has assembled an amazing set of essays from the pageant contestants from that year called "Under the Crown" 51 stories of courage, determination, and the American Spirit. For me, everything that is great about America can be found in the Miss America pageant. Young women striving for excellence and grace. Over the years there have been several protests surrounding the competition. People protested that it was just a beauty pageant and not really promoting feminism. People protested the bathing suits. Then people protested that the bathing suit competition was taken away. Whatever the protest, the fact that we live in a country where we can have this kind of pageant, and peacefully protest it if we want, is a glorious thing. So tonight is a special night for me and for everyone who loves the Miss America Pageant. It is back in Atlantic City. Maybe, just maybe, this is the year for a contestant from the Pacific Northwest to move into the top 10. We'll just have to wait and see.